The Hunt is on! October fall fest is the best time of the year to find the bigger muskie putting on the feedbag for the winter. Fish start speeding up feed rates as the water cools everything becomes more active. The past two years I’ve dedicated more time to chasing these monsters and have yet to land one on my boat. Targeting muskie from as bass boat has its challenges and the ability to troll is not much of an option. This summer I’ve had 3 follows and one hookup but yet to have the muskie slime on the boat. I am hungry but more hungry than these fall muskies. Saturday morning I setting off from the Millsboro, PA with a plan to launch right around sunrise. Most of my trips have taken part in evening trips and this will be my first morning quest. My plan is to go right at feeder streams entering the Mon River. The weather is calling for overcast sky’s with a high around 65 degrees. Water temps hovering around the lower 60’s which should be ideal. River/Creek Mouths – Fish will often be holding close by with the water temperature change coming out of the creeks. Bait fish spawn in creeks during the fall and loads of food means loads of muskies. Rocky Points & Structure – Rocky points & Submerged Structure can become fish magnets, especially during the fall, and muskies will use them as ambush points as they feed actively on bait. Pack Hunting – In the fall Muskie have been know to group up into hunting packs of 4 or 5 fish. Lots of casting and don’t give up. If you get one follow and don’t hook up, look for its bigger sister preying. Bait Colors – In the fall, the water gets colder and the algae start to die. This is when the water starts to clear again and the Muskie’s visibility becomes much better. In the fall, it’s much better to use natural colors like mixed green and yellow (Perch Color) or gold and browns (Walleye Color). They will also hit silver and black, which mimics silver fish like Whitefish, Cisco, Shad and Lake Herring. Muskie will hit bright summer colors but going to colors that are natural for their food chain is much better. 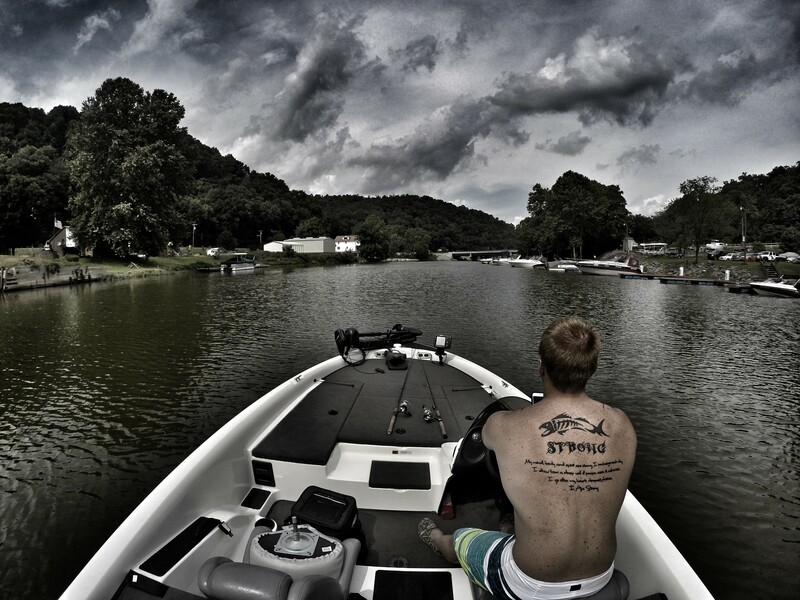 Trolling Speeds – By the time fall comes around, the water is cold. Muskie are feeding a bit more to fatten up for the winter but they are also lethargic from the cold water. With this in mind, try trolling slower then you would in the summer. 4 to 6 miles per hour is a good fall trolling speed. It can get to the perfect speed with a hand held GPS or iphone/android apps. Weighted Jerk baits – A staple in fall muskie angling. Jerk baits – especially those with extra weight – are a mainstay. With a long pull and a slow retrieve, these lures act like a dying baitfish and muskies will often hit them on the pause. Soft Plastics – You can let these lures hit the bottom and slowly reel them back or work them erratically to the boat. Crank baits – There is no better way to fish deeper water or to target fish cruising around schools of bait than to look like the forage they are chasing. Later in the season it’s time to put away the smaller baits and use large minnow baits. Hopefully Saturday I can share with you a pic of my fall muskie. Keep an eye on our Facebook Page for updates!